USA Basketball introduced its men’s Olympic team Monday, seating 12 NBA players in two rows on a makeshift stage inside a hot Harlem gym. And there among the Rio-bound back row were Carmelo Anthony and Kevin Durant, who to fans of the Knicks sure would look great posing together in their team picture. Anthony has been working on it, recruiting his longtime pal, who officially will turn into the league’s most coveted free agent at 12:01 a.m. Friday. But Anthony hasn’t been pressing the 6-9, seven-time All-Star Thunder forward. “At this point in time, we’re friends; we hang out,” Anthony said. “It’s magnified now because he’s a free agent and we’re in New York. But last year, nobody was talking about us hanging out, going to work out or going to dinner, or things like that. The Thunder and the 73-win Warriors are perceived as the top contenders to snag Durant, and the Knicks are considered long shots. They weren’t on the original meet-and-greet list of six teams that has circulated. But the Knicks hope he will add them now that Phil Jackson has added marquee point guard Derrick Rose to the mix with Anthony and Kristaps Porzingis for new coach Jeff Hornacek. 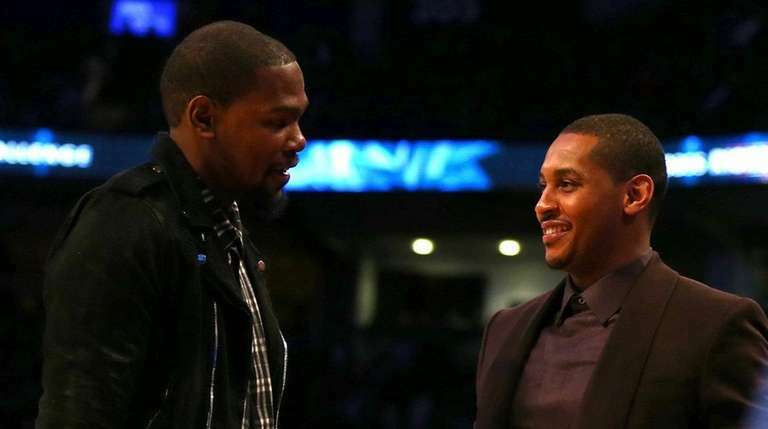 Durant, who owns a career scoring average of 27.4 points per game and a 2013-14 MVP award, teamed with Anthony to win a gold medal at the 2012 Olympics in London. Anthony is very pleased that Rose has joined the Knicks. This will be Anthony’s fourth Olympics, unprecedented in U.S. men’s basketball. Striking gold for a third time would be unprecedented, too. These things ultimately won out over the 32-year-old forward’s Zika virus concerns. He had consultations with doctors about that.